A cute 4" long tin plate clockwork Champion racing car with the celluloid driver. It was made in Japan and comes with a. fixed key. Dating from the late 1950s , it still works and is very clean. In excellent condition, this is a pre war shop dummy pack ( filled with straw) for Pure Ceylon Tea. measuring 7 x 5| , its still very clean but regretfully empty. An original 23 x16" British paper propaganda poster featuring Dr. Carrot. In 1941 " the British Ministry of Food launched a Dig For Victory Campaign which introduced the cartoons ”Dr. Carrot” and “Potato Pete”, to get people to eat more of the vegetables (bread and vegetables were never on the ration during the war). Advertisements encouraged families to start “Victory Gardens” and to try new recipes using surplus foods as substitutes for those less available. Carrots were promoted as a sweetener in desserts in the absence of sugar, which was rationed to eight ounces per adult per week. The Ministry’s “War Cookery Leaflet 4? was filled with recipes for carrot pudding, carrot cake, carrot marmalade and carrot flan. Concoctions like “Carrolade” made from rutabagas and carrots emerged from other similar sources. This poster is unusual in that it is more leaning towards defence rather than cooking. It has been partially glued to a card backing and is folded in 4. There is some damage to the bottom right hand corner and it has faded a bit. Still a very rare poster that really needs framing..
A nice early 1950s Triang Minic tinplate saloon car. It is clockwork and still works and comes with a key. It is approximately 5" long. Generally in very good condition for its age. vintage small dolls house metal corner unit. A charming vintage metal 4" tall wicker corner unit with china accessories fixed to it. It opens at the bottom but is missing the key. Some minor scratches and dents but generally very clean for its age. This is fantastic. Its an early tin plate clockowrk lorry mounted searchlight truck which unusually comes with all the people. The clockwork motor still works but the battery searchlight is untested. 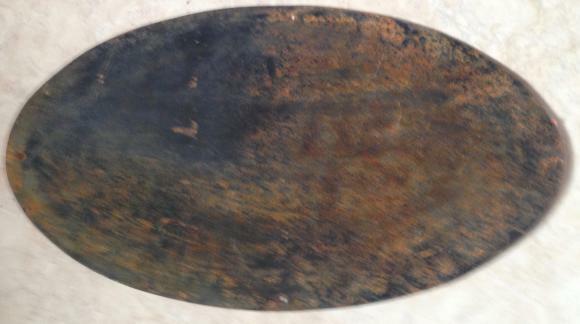 Very few scuffs and measures about 12" long. This wasnt cheap when it was new . In superb condition and extremely rare. A scarce early pre war Triang Minic tin plate , clockwork Tractor and Trailer with its load and instruction leaflet. This is the second series edition. 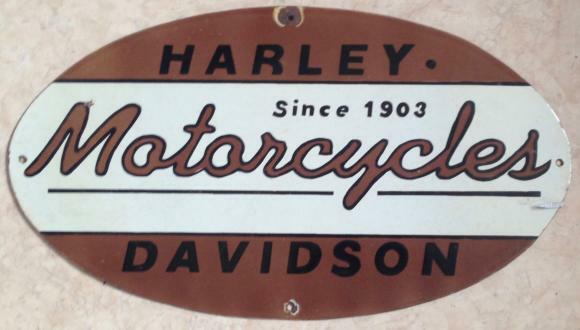 A lovely vintage c late 1950s enamel sign for Harley Davidson motorcycles. It is about 18" long.